A various kind of CD's KT-towers have widely been used for the purpose of telecommunication, for either amateur ham radios and the professional applications use in the commercial field. 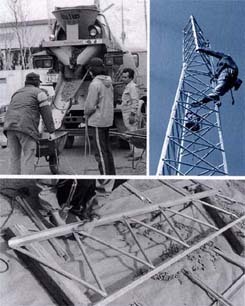 The required conditions for tower selection are the size of your antenna height above the ground. The table given below shows the types of towers and their uses. The load at the top of the antenna tower is given as the tolerable are facing the wind at a speed of 45m per second as calculated for an antenna of ordinary pipe structure. The safety margin of design increases as the antenna height increases. Especially for the tower of 20m/h or more, consideration is given to vibration-resistance characteristics. Top section of the tower has a fitting feature to be able to mount CD thrust bearing CK46 or equivalent bearing of other manufactures of which their applicable diameter the antenna is up to O.D. 62mm. It equips so a fitting feature also in the top section enable to mount CD RC5-Series rotator or of other manufactures. A mount kit is available as a option in the case for mounting CD's larger type of rotator such as a RC10S. The tolerable load (wind surface area) of the tower indicates that up to how large size of antenna will be able to mount on the top of the tower. The figures listed in the each table shows this tolerable load on the assumption that an antenna is mounted 1m below the tower top in the condition that wind speed is 45m/s. 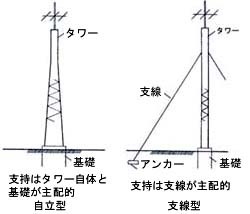 It is important that if this is the case that 2 or 3 antennas are stacked together on the tower top, this value will not simply be calculated out to the equal value of the total sum of wind surface area of each antenna. it is out of condition to determine the calculation either for the case that the site condition is unstable where there is located in high level area where wind speed is higher thatn flat area in low level of land. CD KT-tower come in kits. The length of each section is 2.44m. The main posts and braces are fastened dentirely by bolts. The design is in accordance with the steel structure design standard of the Japan Architecture Society and the U.S. EIA Standard RS-222F. All components are galvanized and will not rust for 20 or 30 years. 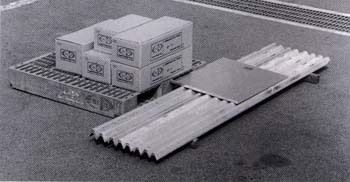 The three main post, made of channel steel, are arranged in a 60 angle cross section. Pipes of optimum design are used for bracing them. These main masts have the best performance cross section and are made of good high tension steel WEL-TEN 60, 70(equivalent to or better than JIS SM-570). These are machined on large-scale equipment which combines high precision with low cost. Tower construction of KT-tower is not particularly difficult technically. Approximately 80% of the towers sold so far by us have been constructed by their purchasers and the rest 40% by professionals. KT-towers are designed to be built by amateurs, but recently more and more often they are being built by professionals.